Home » Stunning Short North Condo! Stunning Short North Condo with walls of windows on N. High Street. One bedroom, one full bath (remodeled) with en suite laundry complete this cosmopolitan floor plan. Enjoy everything the Short North has to offer, all steps from your front door. There is one parking space included with this condo. New flooring in main living area and bathroom features stylish new tile. New kitchen cabinets, appliances, solid surface countertops, and stainless steel backsplash. 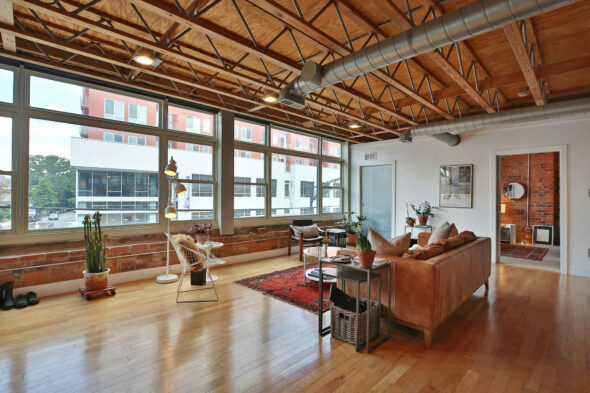 Industrial feel with exposed ceiling trusses and industrial stairwell to the unit.